Our work in Iowa State University Extension and Outreach is for the public good, and our communities and families depend upon us. We’re honored to serve our state – because Iowans believe education and partnerships are how you solve today’s problems and prepare for the future. We are committed to carrying out Abraham Lincoln’s – and now – ISU Extension and Outreach’s legacy, that higher education should be practical and available to everyone. In good times and in challenging times we continue to put the university’s research and resources to work for a strong Iowa. More than 1 million people directly benefit each year. About 100,000 4-H youth are building skills for college and career readiness. We support online courses for 50,000 users. More than 16,000 volunteers partner with us. 1,200 faculty and staff provide education and resources. 900 locally elected council members serve our state. We’re a 99 county campus for Iowans. We’re also online. We reach more than 4 million through our digital presence. Our Indicators Portal provides Iowa decision makers with one-stop access to reliable, current data. 4-H ignites interest in STEM projects, with 11 percent growth in enrollment. Eight counties are investing in engaged scholarship to support Iowa State research in communities. Current projects are building literacy and STEM skills in children and improving quality of life for Iowans with Parkinson’s disease. Nearly 2,000 Master Gardeners volunteered more than 119,000 hours for community garden and beautification projects. Our 4-H Clover Kids program for K-3 youth grew 24 percent last year. In just four months, 10,000 child care providers and teachers enrolled in our preservice training. They’re gaining knowledge and skills to provide safe, healthy environments for children. Eight Iowa State students served as Rising Star interns in 2016, working on regional food systems. Our #ISU99 social media collaboration with Iowa State Athletics raised awareness for extension education statewide. Our Growing Together project has donated more than 62,000 pounds of fruits and vegetables into the Iowa food pantry system through extension nutrition education, Master Gardeners, and ISU Research and Demonstration Farms. We’re helping producers examine their finances, evaluate alternatives, and make informed decisions as they cope with decreasing commodity prices and lower net farm income. A revitalization partnership with Dubuque will address business and residential engagement along its Central Avenue corridor. Farmers are implementing strategies to reduce nutrient loss and improve Iowa waterways. Extension professionals support them as they share best practices with neighbors. We helped 117 minority business owners start or improve their businesses. We also helped create and retain 78 jobs for minority employees. Nearly 2,500 foodservice workers participated in ServSafe® classes; 80 percent earned food safety certification. We partner with the Iowa Restaurant Association in this effort. Our Conference Planning and Management team and the Ames Convention and Visitors Bureau hosted more than 350,000 people for professional development, training, and youth events. We educate producers, conduct research, and help develop job training programs to support Iowa’s $420 million grape and wine industry. Value Added Agriculture feasibility studies and market analyses for 10 Iowa businesses resulted in $57 million in investments and the potential for 248 new jobs. In 4-H leadership accelerators, youth of color use their culture, history, and traditions to explore healthy living, STEM, citizenship, leadership, communication, and the arts. Start to Farm: New Farmer Learning Network groups are receiving extension education and support as they manage and grow their operations. We’re incorporating public-made art in economic vitality and development efforts, because when a community has art, people want to live there. Through crowdsourcing, our Plant and Insect Diagnostic Clinic is working with county extension offices to identify insects, and is developing platforms for plant identification and plant disease diagnosis. We help communities revitalize local food systems to improve food security, increase environmental diversity, and build financial sustainability. Our Presidential High Impact Hires are addressing early literacy, food safety, multicultural education, and integrated cropping systems. Call our hotlines or visit our 100 ISU Extension and Outreach county offices across the state. Contact your county extension council; 900 locally elected council members serve Iowa. Join more than 16,000 volunteers who partner with us. Support us through the Iowa State University Foundation or the Iowa 4-H Foundation. 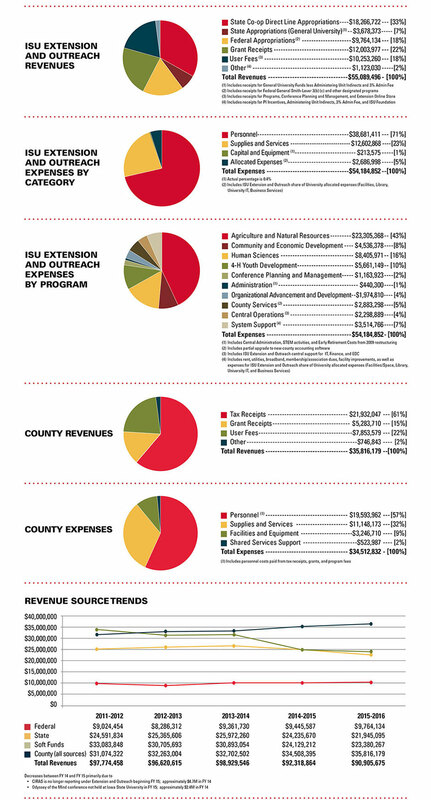 ISU Extension and Outreach did not produce an annual report for 2015. For facts and financials from 2015, see Quick Facts (January 2016).